Description Gift of Minnie Aline. Photo is yellowing and faded. 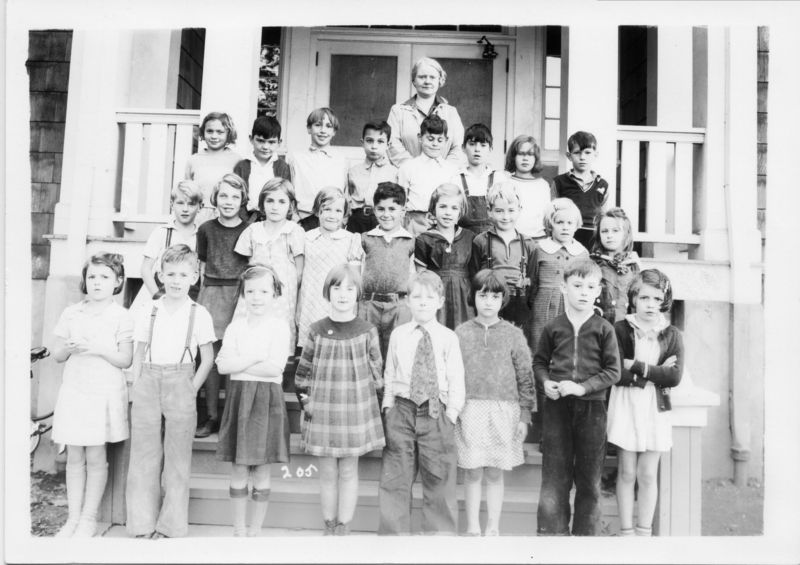 Second Grade, fall 1936. Mrs. Frances Notz, teacher. First row, left to right: Eleanor Sovey,?,Joanne Niesen,?, George O'Hara,?,?,Marian Morris. Second row, left to right:?,?,?,?,?,Roy Wing, Georgeanne Thien,?,?, Minnie Jean MacLennan. Third row, left to right: Virginia Worthington,?,Oliver Collins, Jimmie Promitas, Edward Erickson, Homer ?, Bessie Gray,?, in back, Mrs. Notz. [on front] 205. Physical Description H 5"" x W 7""